How can it be almost a week since The Curve Fashion Festival? I had such a great day and I'm so sad the day is over. I want to do a full post about my experience of the day but over all it's thumbs up from me and I'm really hoping the event will take place in Manchester again next year. I was really unsure what to wear, I had a few choices in mind but I was unsure as the weather has been so mixed and then I received a parcel from a company called Balsamik which had a couple of items which I knew would be perfect for the event. We've been planning a collaboration since June and I'm really happy that these clothes arrived just in time for the event. I overheat quite a lot when I'm in a stressful situation and while I was looking forward to seeing my friends and seeing all the clothes I was quite anxious about the size of the venue but it was worth putting my insecurities behind me. The trousers are so comfortable, they have some elastic at the back and a zip which made them really easy to wear. There is also some stretch to the fabric We all know I adore spots and they are perfect for me. I think they will make it into my work wardrobe as well as weekend wear and I'm planning on wearing them to a family friends Birthday bash this coming weekend. My Plan for work is to wear them with a three quarter sleeve dipped hem top. I have two one from tesco and one from Yours and I think both will work. At weekend I'd just had my hair cut and I felt like I wanted to wear a lighter top so I didn't get lost between hair and top and I think a green or mustard top would look great but I went with the cream one from Tesco. 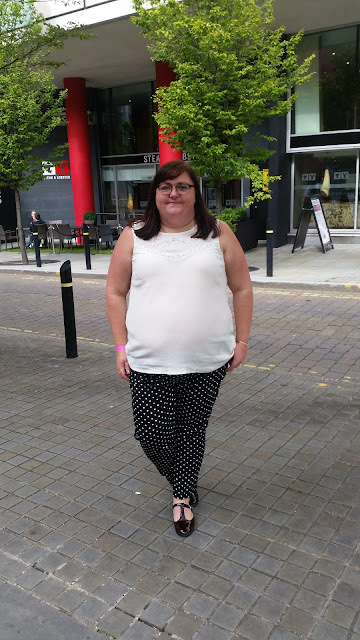 Initially I wasn't sure about wearing a cream top with the black and white trousers but I think it worked well and being sleeveless was the right choice as it was warm inside and it turned into a really nice day. Well done Manchester you should everyone your best side. I wanted to share my outfit from the event with you all, one because I really feel like I've been neglecting fashion posts, two because I actually remembered to get someone to a picture of me (Thank you Sharon) and three because I've seen a few people mention that they didn't go to the event as they felt they don't have the confidence and style to attend an event. 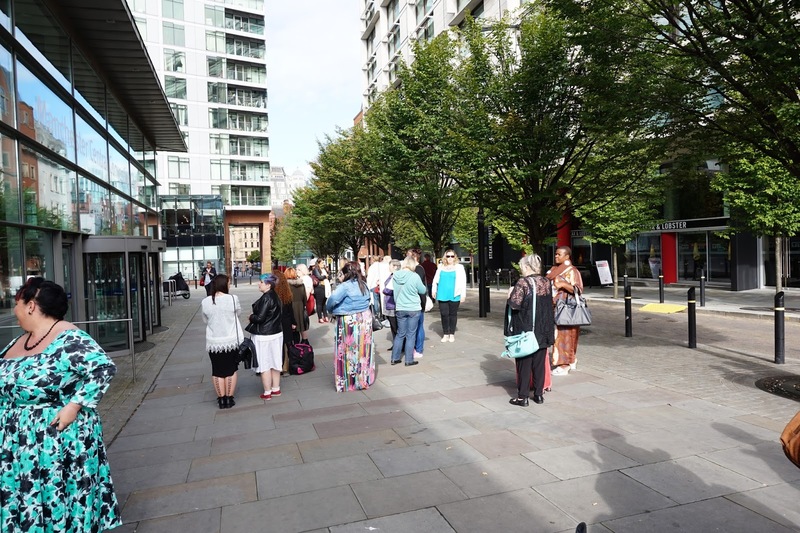 Firstly the event wasn't a blogger event, it was open to all and while a lot of bloggers were there I do think there was a lot of non-bloggers there as well. I wanted to try and find a crowd picture to show all the different styles. You have you're own style and while people follow trends or seasons don't live you're life by them. Wear what you enjoy, make sure you feel confident. If someone makes a mean comment to you ignore them they have no right to make you feel bad or project their own insecurities on you. Are you planning on going to any events? Let me know I'd love to say hello to you and keep your eyes open for my full post about the Curve Fashion Festival in the next week or so. The Items from Balsamik were provided free of charge for the purpose of review and as always all opinions are my own.